BEIJING, China (CNN) -- A crowd of up to 2,000 people attacked a local Communist Party headquarters in northwestern China's Gansu province early Tuesday, state-run media reported. Farmers grieve in front of their destroyed property in the aftermath of the May 2008 earthquake. The conflict stems from plans to relocate the city of Longnan's administrative center after May's deadly earthquake that devastated the region, according to the Xinhua news agency. About 30 citizens opposed to the move gathered Monday morning at the party office. Over the course of the day the crowd swelled to several thousand before "some complaining people attacked (the) Municipal Committee office building, smashed some vehicles and office facilities," Xinhua reported. Bloggers put the size of the crowd at 10,000 people. One post said the decision to relocate Longnan's administrative center to a neighboring county had stopped the construction of temporary housing for thousands of families and would force many of them to move. One of the blogs said the crowd became violent when armed police were dispatched and city officials refused to speak to them. Attempts to call local officials went unanswered. Regional officials told CNN they heard about the incident, but had no information. 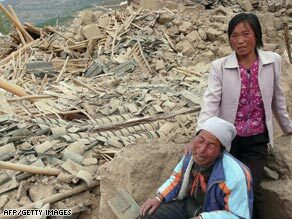 The May earthquake killed tens of thousands of people across northwestern China. In Longnan, 275 people died and another 6,000 were injured. More than a million homes were destroyed or damaged. CNN's Yuli Yang contributed to this report.